The Ford Transit Connect Camper is a sporty mini van for singles and couples looking for a daily driver and a small camper all in one compact vehicle. 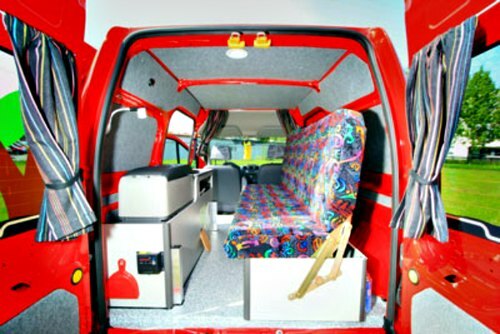 Mini campers are gaining in popularity and the Transit is no exception here. It's easy to drive, simple to park, gets great gas mileage plus you can park it in almost any garage. An excellent adventure vehicle giving camping a whole new perspective. Previously my wife and I traveled around in a similar mini van, and do take my word for it, it is way more comfortable than sleeping in a tent! But let's take a brief look at some the van's background first. This small front-wheel drive van was introduced in Europe in 2002 as a rival to mini vans from other European manufacturers. The van itself is produced in both versions, as a commercial and a passenger vehicle. First vehicles arrived in the United States and Canada in mid 2009. To avoid the 25% "Chicken Tax", they come imported as passenger vehicles with rear seats, windows and seat belts and are converted at a United States facility to commercial vehicles. All the remaining parts are recycled though. Partially, this is the reason why the North American market gets only the long-wheelbase and high roof version and only one 2.0L petrol engine. The rest of the world gets also the short wheel-base and normal roof version and a 1.8L diesel engine with a variety of horsepower under the stable. I never quite understood bureaucracy, neither is my intention to do so. So, let's keep the "black suits" happy in their own way and move along with our life. After all, the long-wheel base and high roof configuration makes a lot more sense for the Ford Transit Connect Camper van conversion. Every inch counts for comfort in a mini van, don't forget that. This is an "Award wining van" in Europe and United states, so what you get here is a nice, solid base for a camper conversion. The new and improved second generation of the Transit Connect has already been introduced, and will hit the markets somewhere in 2014. The van will be slightly larger, obviously more "stylish" and with new engines and transmissions to go with. You can either start a homemade camper project or you find someone to do it for you. The choice is entirely yours. 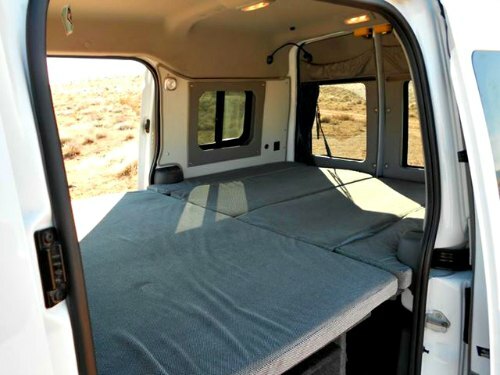 To say the truth, there is only a handful of professionals out there, that will build a solid Ford Transit Connect camper van. The rest are simply homemade projects. The Transit is a nice and small van to work on, so all you have to do is use your imagination, be creative and resourceful. You can build your own camper just the way you want it by following a few basic steps for any conversion. Once you're done with all that, please read the build your own camper page on my website to get the basic idea of how a homemade conversion gets done. There are many "DIY" tips & tricks in that page, so take your time to read it out thoroughly. Click on any image on this page to open up the image gallery. Some folks are perfectly satisfied by just throwing an inflatable mattress on the floor of the van. It's lot better than sleeping in a tent of course, but there will be a lack of storage room here. So building a frame for the bed to have some storage room underneath is a logical next step. You can use either wood or aluminum to build the frame. Remember, the lighter, the better. Use large tool boxes or something similar to keep your gear organized in the storage compartment. Or build a camping box with drawers that to pull out all the way in the back when the rear doors are open. If you need some more comfort, build a bed/sofa unit on one side of the van and have a nice small kitchen with some cabinets on the other side. The cabinets can contain a camper refrigerator and a stove if you wish so. A portable, single burner cartridge stove is a very practical solution in this case. This way you eliminate the need for propane hosing around the van and can cook either in the van or out in the open. The choice depends entirely on your imagination. If you need some more ideas, please check out the mini camper page with more images and videos full of fresh ideas or take a few minutes to watch the video below. Remember to take your time, be patient and plan things thoroughly. As I said before, there is only a handful of professional conversions out there and some of them are really awesome. One of the best is the Dutch made Campuniq. This is a fully loaded camper van, with a swing out kitchen unit, refrigerator, gas heater, lots of storage room and a double bed/dinette unit. The pop-top roof is a unique feature for additional headroom and air circulation. It's made from fiberglass with the sides wrapped around in cotton canvas. It pops up using gas struts and hinged guides. Check out the video below to see this outstanding camper van conversion with all the unique features hidden inside of it. The pop top roof is available from Reimo, one of Europe's leading camper van conversion and camping specialists based in Germany. A full range of accessories with camping and outdoors equipment is available through many dealers in Europe and around the world. 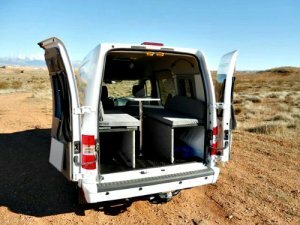 Sportsmobile for example is one of the North American companies that can help you out with your Ford Transit Connect camper project, so don't hesitate to contact them. A few models in the image gallery are actually converted by these guys. Get busy, check around, pick up the phone send a couple of e-mails and see what you can come up with. And if you come up with something creative, please do let me know about it! 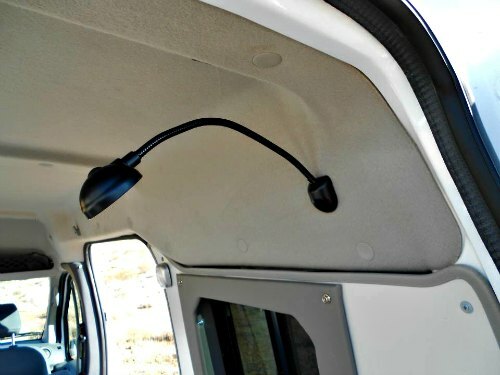 The Ford Transit Connect camper can be also equipped with some of the usual set up of camper accessories to make your trip more comfortable or to increase storage capacity. So give these a second thought before you head out on your next adventure. A few small rental companies even rent the Ford Transit Connect camper so you can enjoy exploring the world in a practical and hassle free camper. If you wish to discover the magnificent American West in style and comfort of their customized camper vans, visit www.campervannorthamerica.com and enjoy the ride. For an even more intense adventure immersed in the natural beauty of Iceland, visit www.happycampers.is and drive around one of the most stunning landscapes on planet earth. Iceland is the land of ice and fire, therefore well worth a visit. The Ford Transit Connect has proven itself as a rugged and sporty vehicle capable of many tasks and fleets of rental vans above speak for itself. 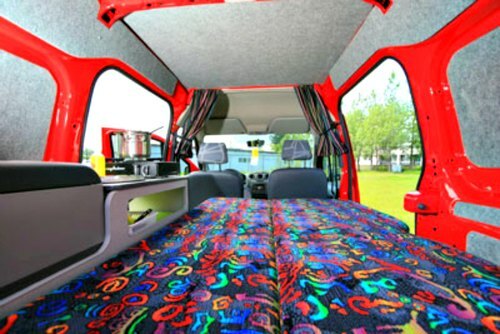 Being one of the largest mini vans on the European market it is definitely a favorite choice for a camper van conversion. And with the brand new model behind the corner, my wild guess is that there will be a lot more interesting Ford Transit Connect camper conversions coming around in no time. Yours might be full of interesting solutions, so why not share it with the rest of us? Do you own a Ford Transit Connect camper? Share it with us!